The part that is memorable is when Joey pigza made bumper stickers. The thing that the bumper stickers reminded me of is when I was in kinder and I was the student of the week and I was going to get a bumper sticker but they didn't give it to me. One thing that I don't like about Joey is that he gets annoying because he talks a lot. One thing that I like about the plot is that when I keep on reading the story get's better. Joey behaves bad at school. 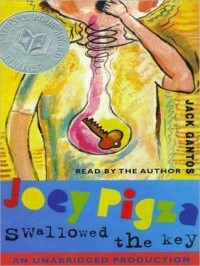 One thing that I liked about the book so far, is that Joey's Mom left him with his grandma many years because she tried to fix her relationship with joey's dad.